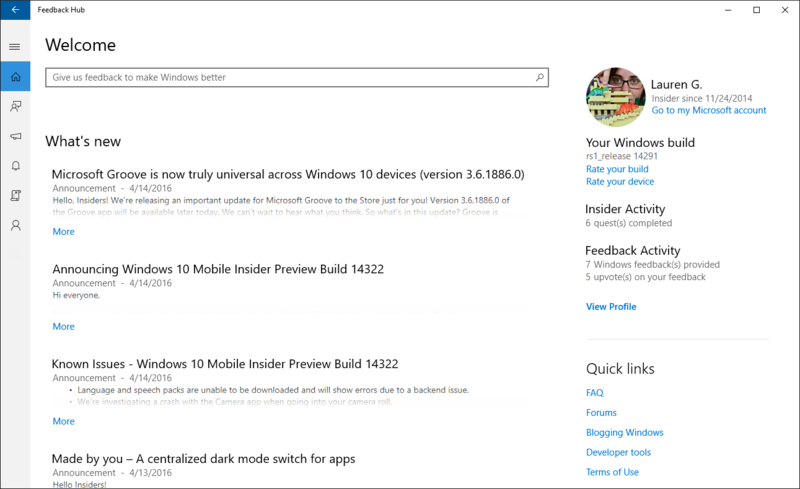 The Feedback Hub is the go-to place for Windows Insiders to get the latest news about preview builds and to provide feedback to help make Windows better. 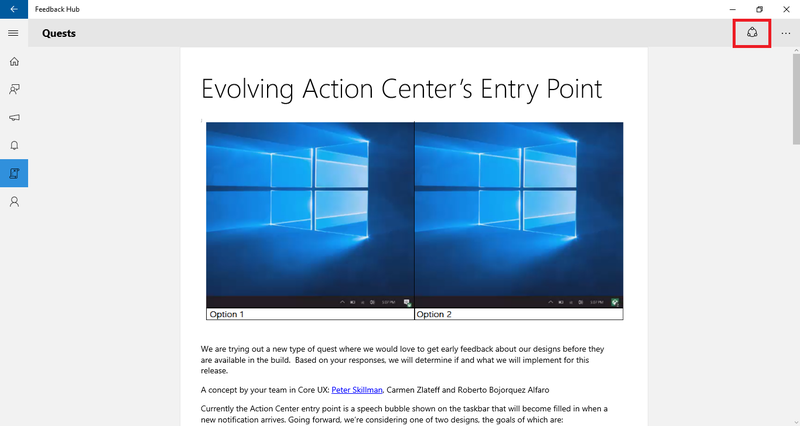 It combines the best features from the Insider Hub and Windows Feedback apps into a single place to help you stay connected with the Windows Insider Program. As we build new features into the app, we’ll provide additional updates along the way. When you launch the Feedback Hub, you'll see a feed of the most recent quests and announcements on the homepage. If you'd prefer to browse only quests or only announcements, select Quests or Announcements in the navigation bar. If you'd like to share content, you can do so by using the Share button at top of the page when you're looking at a particular announcement or quest. 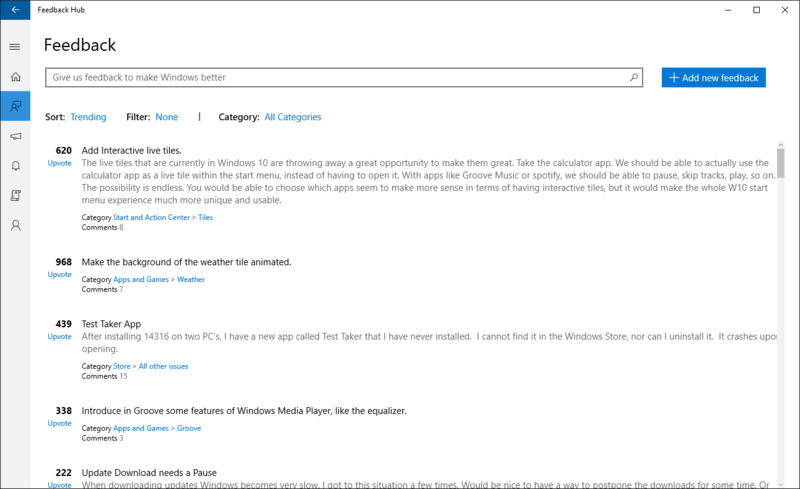 We appreciate your feedback and want to make sure we can use it to make your experience in Windows 10 a great one. So below we have provided a few pointers about ways to send us your feedback and what you can do to help us take action on your feedback. When you encounter a problem or have a suggestion, open the Feedback Hub app and start typing in the search bar at the top of the page. As you type, we'll show you feedback that may be similar to yours. If you see feedback similar to yours, simply upvote it to tell us that this problem or suggestion is one we really need to pay attention to. Tip: You can use Sort to see trending, top upvoted, and the most recent feedback submitted by other Insiders. Oh, and keep in mind that your feedback is visible to other customers as well, so please be polite! 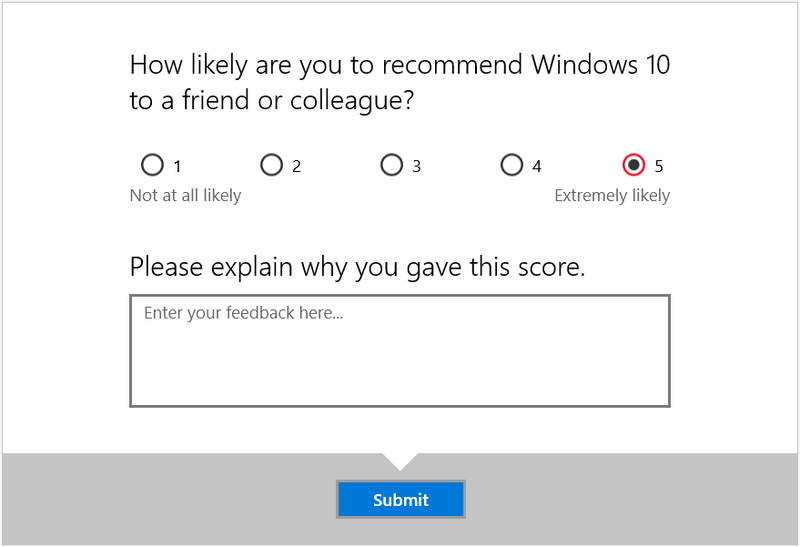 When we get your feedback, Microsoft engineers will read it and determine how to address your feedback. They will do their best to provide a response to keep you informed of the status of your feedback. They may also reach out if they need more information, or to tell you if your feedback has been addressed and which build you can see it in! Tip: You can always find your feedback by using the Filter and selecting My feedback. How useful was the content on the new tab page? How hard was it to add an account? How satisfied are you with Microsoft Edge? Take a moment to tell us, for example, if you were very satisfied, not satisfied enough or somewhere in between. If you have a moment afterward, we'd love for you to answer our follow-up and tell us what we can do to make your experience better! 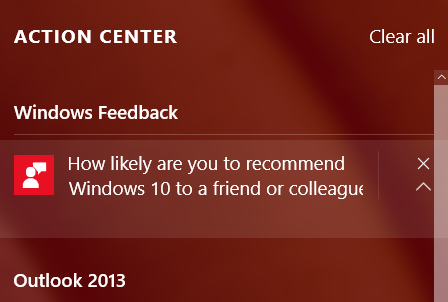 If you miss a mini-survey notification, don’t worry--we'll keep it in the Action center for you. Please respond to it as soon as you can because we really want to know about your experience. As part of sharing feedback about your experience, you can send a rating of the current build you're running by clicking Rate your build. Tell us how likely you are to recommend it to someone! Your Insider profile shows your participation, like how many quests you’ve completed, and how much feedback you’ve provided. As you do more activities, you’ll earn achievements in recognition of your great work. 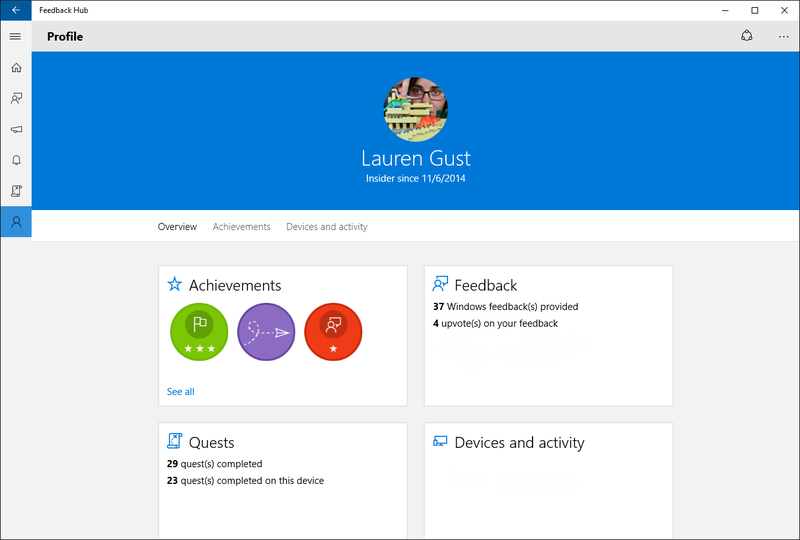 Don’t forget that you can also provide feedback on the Feedback Hub and the Windows Insider Program itself, from within the Feedback Hub! Please feel free to let us know if you have any suggestions or problems with the app or program.